Mutton, Mutton, Whose Got the Mutton? I’m a history geek. I admit it. I just can’t seem to help myself. So when my husband and I stumbled upon a museum that had recreated an entire town, we couldn’t resist. Actually, I couldn’t resist – and my husband is a really patient man. While I was wandering through one of the immaculately restored buildings, I stumbled upon a collection of tin cans that once held various types of food. One of the most popular? Canned mutton. Just the sound of it made me shiver. Eeew. But, my modern prejudices aside, it was an extremely popular item with many miners, homesteaders and other early residents of western Colorado. Canned mutton was inexpensive, traveled well, could be heated over a camp fire, and provided much needed protein. But… even with all of those virtues, it was an acquired taste with a very strong odor, and a taste to match. Thanks to Charles, Prince of Wales, mutton in making a comeback. He touts it as his favorite dish and has even organized a Mutton Renaissance Campaign to encourage Britons to eat more mutton. As admirable as this is, I’ll bet Prince Charles doesn’t eat his mutton from a can. Canned mutton actually makes two appearances in my book. Neither of the characters in my book who ate it liked it. But they did eat the stuff. Cold mountain weather and lack of resources will do that to a person. My culinary experiences with mutton are limited to the occasional roasted lamb at Passover. Somehow, I suspect that’s not a fair comparison. Have I ever tried canned sheep meat? Nope. Do I plan on trying it? Nope. I live vicariously through those people I make up in my head. (That’s what fiction writers do. 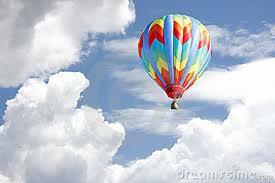 We populate our lives with imaginary people, who do things that we, the writer, may not ever really do.) And they said not to eat the canned mutton. So, here’s to the stalwart men and women who left behind their empty tin cans and untold stories. They endured harsh Colorado mountain weather, lack of resources, and hardships I can only imagine. I salute you. But the mutton? I’ll leave it for you. 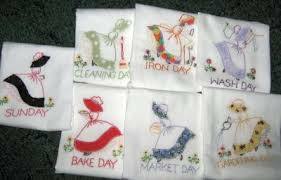 By the time I was drying those Melmac dishes, the way of life embroidered on our tea towels had all but disappeared and those little slips of linen were a last, lingering reminder of days gone by. But this well known schedule is the way everyone kept house for more than a hundred years. And, it makes a lot of sense when you think about it. Laundry was the heaviest task a housewife faced, requiring a great deal of strength and determination (also known as grit) to haul the water from the well, build the fire to heat the water, hand-wring clothes and carry big baskets of wet laundry to the clothesline from the washtubs. Monday was the day to tackle this monumental chore, when you were still fresh and rested from Sunday. Tuesday’s ironing followed Monday’s wash. Mending and sewing on Wednesday made sense when you’d just been through the clothes and noticed what needed a button or a patch. According to my grandmothers, a good housewife had her laundry on the line shortly after sun rise Monday morning. Unless it was raining. Snow? That didn’t slow them down much. Those clothes just froze right to the line, and there was usually a good, strong wind whipping through at the same time. Brr. When did they squeeze in the task of making the lye soap to wash the clothes? Maybe that was a rainy Monday chore. No wonder they called this the Happy Day washing machine. She had to sit down to agitate those clothes! As for me, I’m extremely thankful for my aging and slightly shabby Kenmore washer. And I’m also really thankful that I can do my laundry while watching an X-Men marathon. Yep, that’s a definite improvement over “the good ol’ days.” I think I’ll follow my grandmother’s advice, and make a cup of tea and count my blessings. After I fold this load of towels. Oh Happy Day – Or Blue Monday? Did you know that at one time, you could order an entire house from the Sears catalog? According to Sears Archives, in 1908, Sears issued its first specialty catalog for houses, Book of Modern Homes and Building Plans, featuring 44 styles ranging in price from $360–$2,890. The first mail order was filled in 1908. 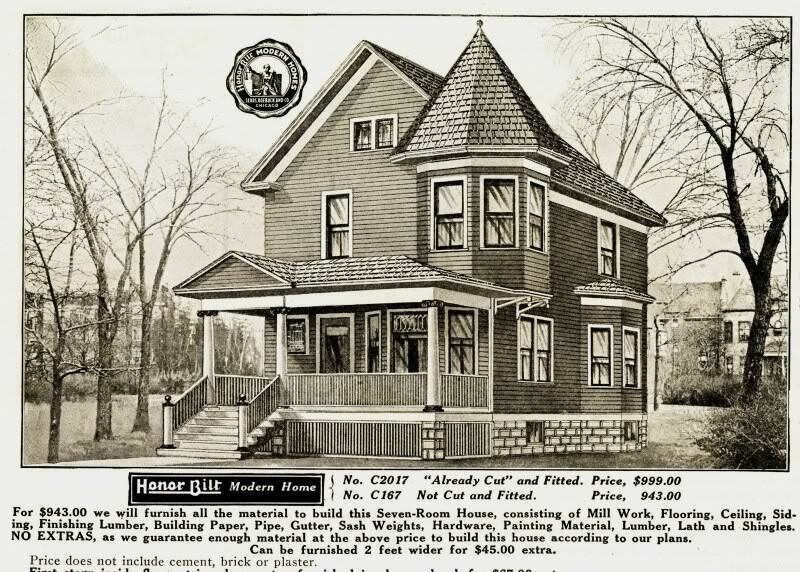 Sears sold about 70,000 kit homes in 48 states through their mail-order Modern Homes program during the years of 1908 – 1940. Sears sold so many of these homes that they opened up their own mill in Cairo, Illinois in 1911. Sears kit homes were shipped via boxcar and came with a 75-page instruction book. Each kit contained 10,000 – 30,000 pieces and the pieces were “marked to facilitate construction.” Yeah, right. All you had to do was unload it, schlep it to your building site, read that 75-page instruction book, figure out what went where, and put it together. Kind of like a giant 3-D puzzle. Or Lincoln Logs. But with a lot more sweat and potential for swearing. Neighbors and friends usually helped build the house with a good old-fashioned roof raising party. Neighbor relationships have changed a little in this last century. I don’t even ask my neighbors to check my mail when I’m out of town. Because my story takes place in 1904, my characters can’t live in an actual Sears kit house… the timing is just a little off. Nevertheless, this is the house that I pictured in my mind as the Johnson family home in Season of Forgiveness – but I added a second porch on the right side and flipped the kitchen to the other side of the building. That’s the beauty of writing fiction. It can be whatever I want it to be. I can picture in my mind’s eye the porch littered with toys and seven rowdy boys slamming doors and racing up and down the steps. And of course, Emma’s roses would flourish beside the porch. I had a lot of fun creating this home in my story. I hope you enjoy it too.